Hi everyone, I’m Anna from On The Dressing Table and I have been a regular reader of Stacey’s brilliant blog since the early days. Her hauls are the stuff dreams are made of and she has definitely enabled me to make some pretty spendy purchases! I love the fact that Stacey has tried just about everything that is on my wish list at any particular time and I have come to really value her opinions on all things beauty. Although it’s an honour to feature on her blog as a guest writer I wish it wasn't under such distressing circumstances. I think it’s so brave of her to share her story with us all to raise awareness of the importance of regular smear tests; I know I have made sure mine is up to date and reminded all of my friends to do the same, so essentially by sharing a very personal diagnosis with us she might well be preventing others having to go through the same trauma that her and her loved ones are going through now and I just wanted to say thanks Stacey, and wish you a full and speedy recovery. My current base of choice is Laura Mercier Silk Crème in Beige Ivory. I love this because it gives a full coverage without a heavy, flat finish, I always feel like I’m having a good skin day when I’m wearing this! I use the Nars corrector in Pear, which is yellow-toned so counteracts the redness in my cheeks. I just stripe it on where I need it and blend in with my fingers or a brush. The formula of this is really good - it isn’t too slippy so it sits really nicely under foundation and lasts all day. 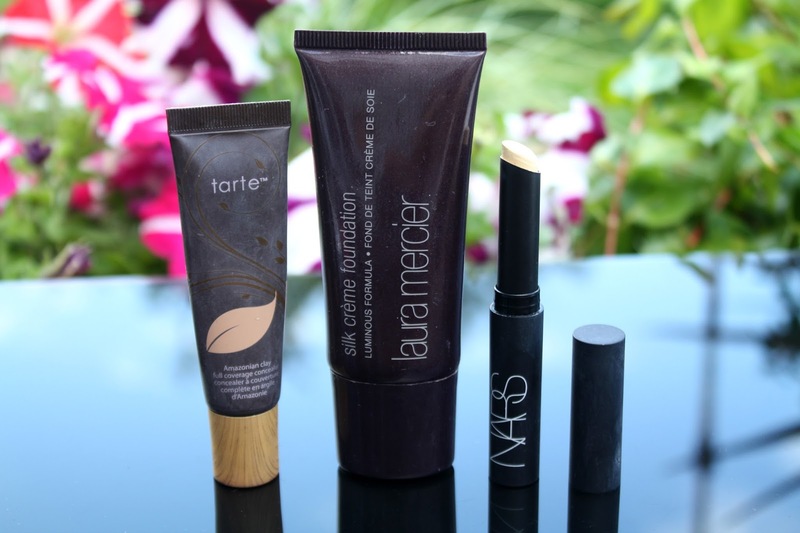 To conceal under my eyes I have been loving the Tarte Amazonian Clay Full Coverage concealer in light. This really does cover everything! It lasts really well too and although light is slightly pale for my skin at the moment it has a nice brightening effect under my eyes. To finish off my base I have been using Chanel Les Beiges Healthy Glow Sheer Powder in No 20 which takes away any shine but still leaves the skin looking fresh and youthful, I really like the finish this gives, i have found it can get a little cakey if you are too heavy handed though. My all time favourite bronzer is Bobbi Brown Bronzing Powder in No 1 Golden Light which has enough red in it to warm the complexion but enough grey to stop it from looking orange, it's completely matt and I just find this shade looks so natural on my skin tone. To contour I always use Kevin Aucoin Sculpting Powder in Medium and if there is one thing in my makeup bag I would urge you to try this is it! 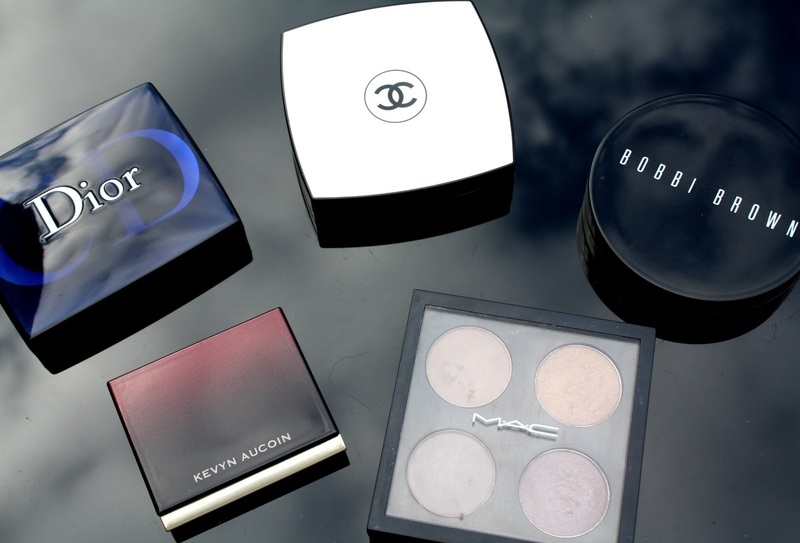 I’ve tried loads of different products to contour and for me, nothing compares! 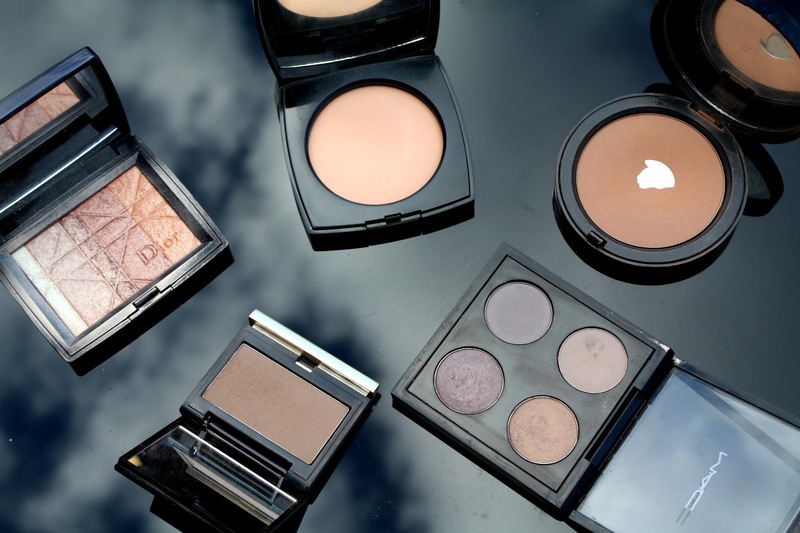 It’s super pigmented, incredibly blendable and creates the most natural looking shadow. It's my secret weapon when it comes to creating definition! I’ve recently rekindled my love for the Dior Amber Diamonds highlighter because it seems to work on my skin tone best during the summer months when I have a bit of a tan. It gives a really lovely glow to the high points of the face and the powder is so finely milled its barely detectable on the skin - no glitter to see here! I usually carry my MAC quad around with me and just change up the shades from my 15 pan pallete. The shades in it at the moment are Omega which I use to fill in my brows, Copperplate, Satin Taupe (my all time favourite mac shade) and Patina. The other eye products i've been using recently are the Mac Constructivist Paint Pot which is a great base for a bronze smoky eye or a quick one-step look if im in a rush, although i find that unlike other paint pots this one creases on me. 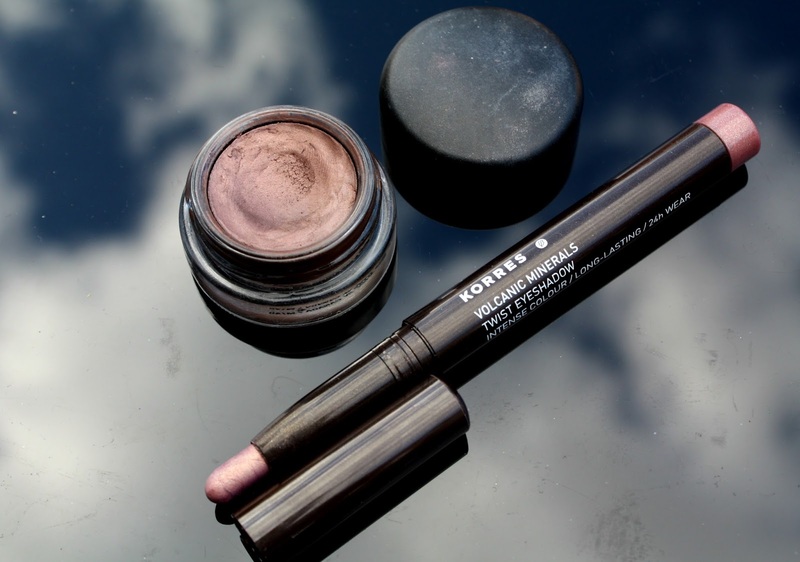 This is not an issue however with the other cream shadow from Korres which literally does. not. budge! It's equally as long lasting as the By Terry Ombre Black Stars and is a good dupe but i'm not sure how widely available they are as i picked this one up recently in Greece for around 10 euros. There isn't a shade name on the packaging, its a pink/gold duo-chrome and is pretty but i wish i had picked up the taupe shade instead! 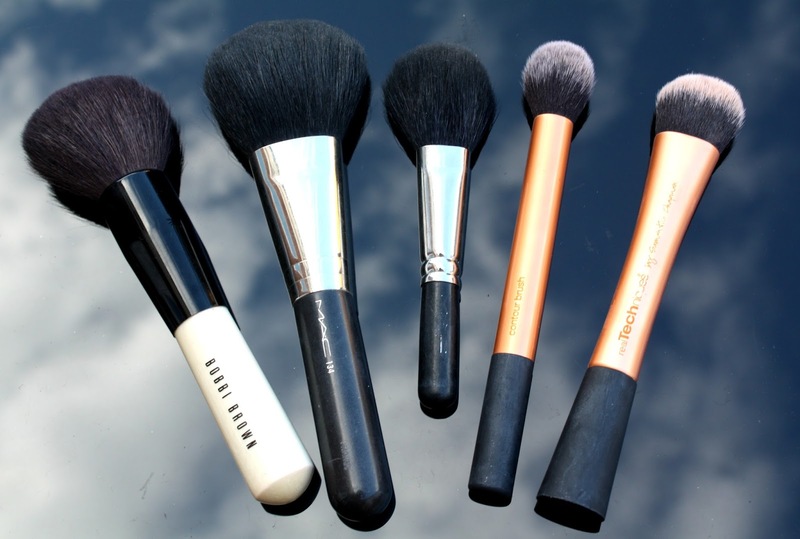 Brush wise on my face i've been using the Real Techniques Expert Face brush to buff in foundation, the MAC 134 for my Les Beiges powder, the Bobbi Brown Bronzing brush for bronzer, Real Techniques Contour brush with my sculpting powder and the MAC 129 for blusher. On my eyes, like Stacey, i'm a big fan of the MAC 239 to pack on product and the 217 to blend into the crease. I also like the 224 to blend because its super soft and fluffy - it's a good 'finishing off' brush. 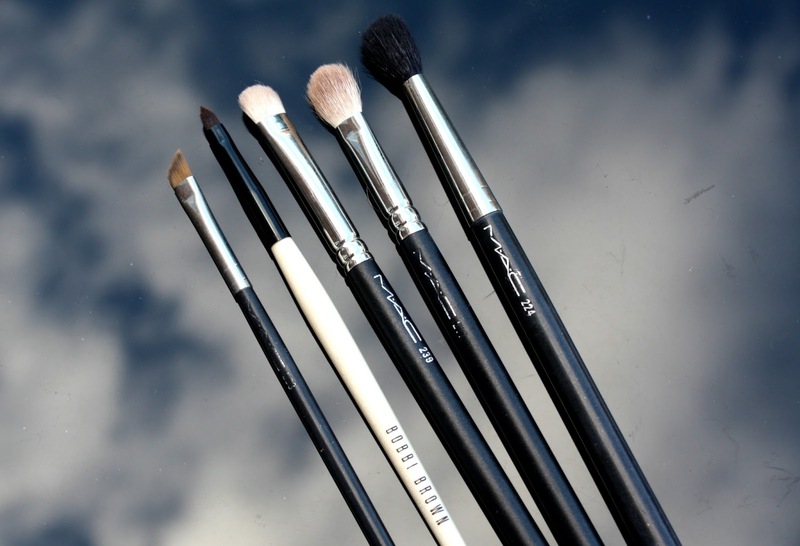 I like to use the Bobbi Brown Eye Smudge brush to blend cream eye products because its a bit shorter and denser than the Mac brushes which gives you a little more control. I use the 263 angled brush to fill in my brows and the Bobbi Brown Ultra Fine Eyeliner brush is in there, not to use with gel eyeliner as it is intended, but to highlight the tear duct area of my eye with MAC Vanilla pigment which really brightens my eyes and makes me look more awake! Because its so tiny and quite stiff it really helps me to place the product exactly where i want it. 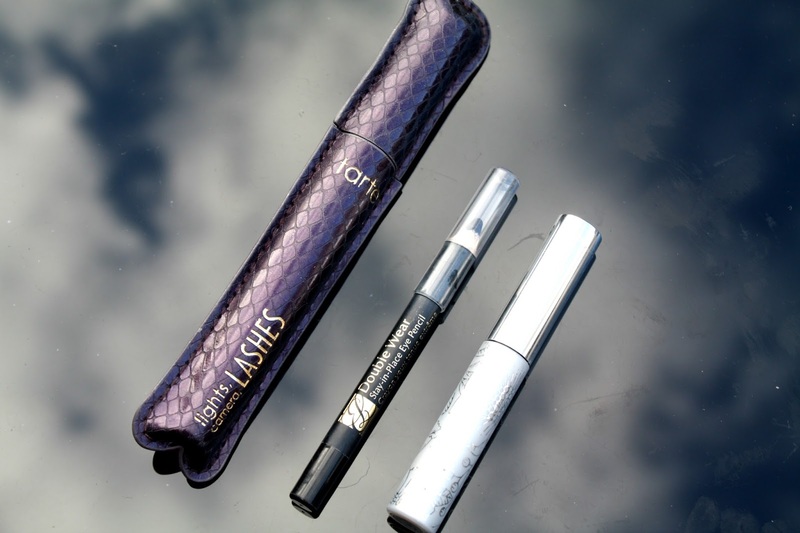 I honestly haven't used any other mascara since i got Tarte's Lights Camera Lashes, i absolutely love this product. If you want a mascara that does everything i would highly recommend this one, it adds curl, volume and length whilst nourishing and conditioning the lashes. It lasts all day, doesn't flake off and removes like a dream - what more could you want?! I use the Clinique bottom lash mascara when i need my make up to really last because the formula doesn't smudge or flake, and the tiny brush makes it easy to really define your lower lashes a la Kim Kardashian! My current eye liner of choice is the Estee Lauder Double Wear one which is really black and does last well - i think it's comparable to the much cheaper Rimmel Scandaleyes in terms of longevity, but i haven't been wowed by it and i wouldn't rush out to get another. You can probably tell that i have been favouring a bright lip recently! I have been trying out the new GlamMatte Intense Matte Lip Glosses from L'Oreal in the shades Coral Denimista and Cherry Crop. I really like the formula of these although to me, they are not matt! They are more along the lines of a liquid lipstick without the drying formula. 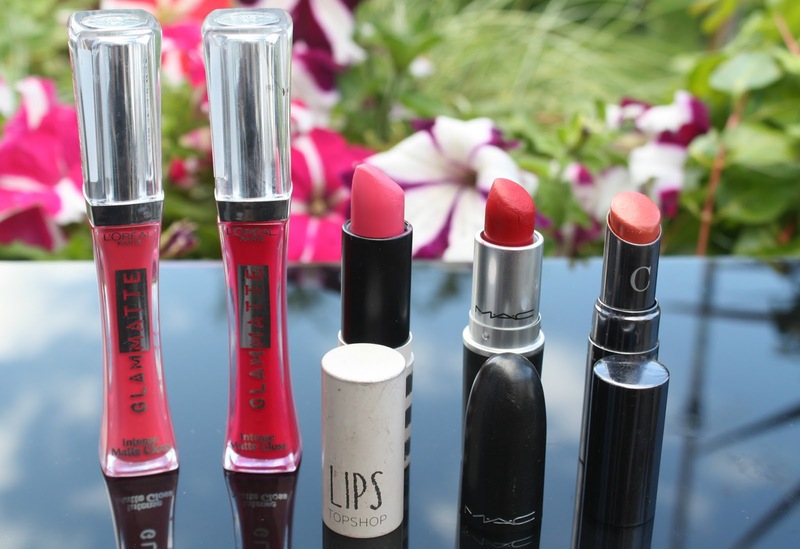 I have also been loving MAC Ruby woo, my favourite true red shade, Topshop lipstick in Brigton Rock which is a nice vibrant pink and Chantacaille Lipchic in Geranium which is without doubt my favourite lipstick of all time (bold statement!) which i have reviewed in full over on my blog. 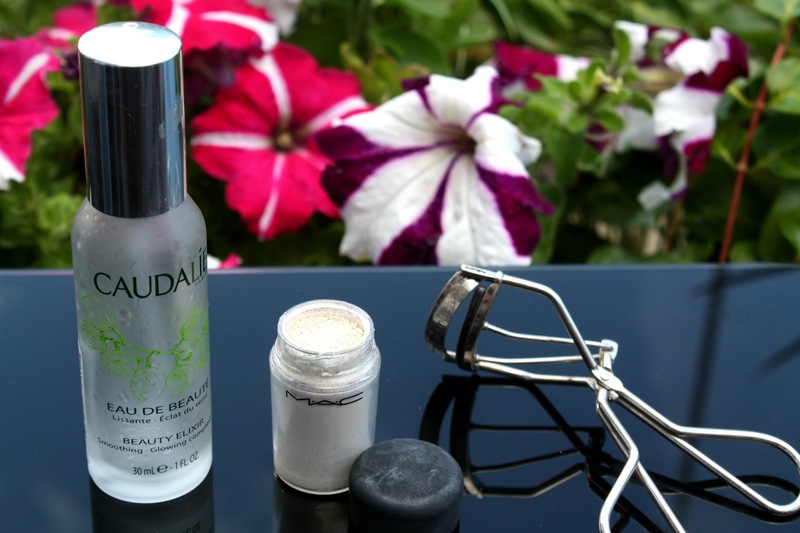 The other bits and pieces in my make up bag at the moment are my Shu Uemura eyelash curlers which i use everyday, MAC Vanilla pigment which i mentioned above, and Caudalie Beauty Elixir which is so refreshing to spray over make up it is a godsend on a hot day! So that's everything, is that a lot?! I really hope you've enjoyed having a little rummage in my make up bag, leave a comment and let me know what your make up bag essentials are. Guest Post | The Lip errr...Five?